Whether you are operating in a small kitchen or enjoy tidy counters and cabinets, an organized kitchen can help promote meal preparation and practical storage for kitchen utensils, dinnerware, and dry goods. 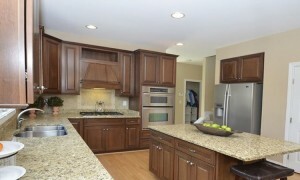 The kitchen is one of the most commonly used rooms in a home. Whether you’re operating in a small space or enjoy tidy counters and cabinets, an organized kitchen can help assist with meal preparation and provide practical storage for kitchen utensils, dinnerware, and dry goods. Consider the following kitchen organization tips so you can reap the benefits of a clean and orderly culinary space in your DFW home. Items you use most often should be easy to find and grab. For example, spices and herbs that you use on a regular basis should be placed at the front of a cabinet or storage container with lesser-used spices toward the back. The same principle goes for cookware and dinnerware: Place large pots or fine china that you rarely use in less accessible spaces so you have room for daily items such as plates and skillets that can be easily pulled out of cabinets or large drawers. Rather than leaving a messy bag of opened flour in your pantry, use organizers, such as jars or sealable canisters. 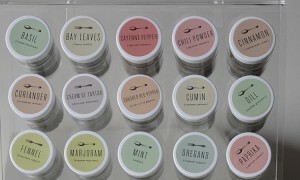 Not only will this help keep pantry staples fresh, properly labeled containers will help you find what you need quickly, while eliminating the likelihood of mistaking ingredients such as sugar for salt. Clear containers also promote efficiency because they allow you to see what’s inside. If you like your containers to have a unique look, pick up something eye-catching at these premier DFW home furnishings stores. Or if you prefer to get crafty, Martha Stewart offers a DIY tutorial for etched glass storage jars. If your cabinets or countertops are cluttered, there are a number of ingenious ways to maximize limited space. For example, you can purchase specialty cutting boards with a built-in colander that fit over your sink. And for a creative storage solution, get vertical: You can store items on wall-mounted hooks, racks, and magnetic holders. Instead of a counter-hogging bulky knife block, you can use magnetic knife strips to hold kitchen knives against a cabinet or backsplash. Most kitchens have standard silverware dividers, but to cut down on clutter, you’ll also want to organize large stirring spoons, ladles, and other common-but-bulky utensils like pizza cutters and vegetable peelers. Many supermarkets and home stores carry larger compartmental organizers for bigger utensils. 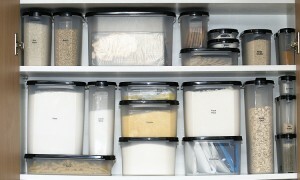 HGTV.com points out that expandable mesh containers are easy to fit in different-size drawers, and their mesh construction helps keep utensils stored sanitarily. No need to root around in cabinets and countertops — lazy Susans offer access to your stored items, with just a simple turn. A small lazy Susan is perfect for efficiently storing spices and herbs, while larger lazy Susans can store light pots or pantry items like canned goods or sauces. Ready to start using your kitchen more efficiently? With this short list of kitchen organization tips to get you started, you can be enjoying a clutter-free kitchen in no time.